P&M OptoMax is a state of the art plug-in for use in your favorite digital audio workstation. 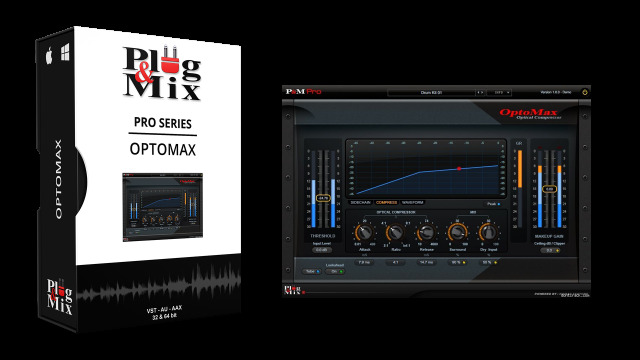 P&M OptoMax is designed to give you precision dynamic control over any type of media whether its vocals, drums or entire compositions. The plug-ins intuitive user interface allows for effortless control over compression levels, and frequency side-chaining, as well as other crucial sonic analysis tools. - Threshold: Sets the input level at which compression will begin. - Input Level: Adjusts the level of the input signal. - GR Meter: Shows the amount of gain reduction being applied to the input signal. - Makeup Gain: Sets the amount of gain applied to the signal after compression. - Attack: Sets how long the compressor takes to kick in once the input signal exceeds the threshold. - Ratio: Fixed values for accurate instrument and bus compression. - Release: Sets how long it takes for the compression to stop once the signal has dropped below the threshold. - Dry Input: Adds the unprocessed, direct signal to the mix for serial or parallel processing. Turn Dry Mix On/Off by clicking the button below the knob. - Tube: Restores warmth and detail lost during digital compression. - Lookahead: Turns on Compressor’s Lookahead feature enabling it to duck the sound earlier than a triggering peak appears. - Surround: Increases stereo imaging and depth of field. - Clipper: For limiting your signal’s overall output. - Peak: Displays the Peak decibel or RMS level.